From left, Gail Katz, Judaism; April Cook, Christianity; Ranya Shbeib, Islam. Sashabaw Middle School (SMS) seventh graders learned about religious diversity from worshipers of six different religions during their world religion unit. The Interfaith Leadership Council paired with seventh grade classes to bring in speakers from the three Abrahamic religions and three of the world’s eastern religions. They discussed their scriptures, holidays, beliefs and practices. “We do lots of panels and interfaith educational events, but we haven’t brought it into the schools yet. This is our kick-off trial to see how it goes,” Interfaith Leadership Council Program Director Meredith Skowronski said. For many years, SMS has paired with the council to do religious diversity journeys, but only 25 students are able to go on them, said World History Teacher Sue Wilson. “They spend a whole day at these houses of worship just eating traditional food, asking questions, learning from the religious leaders, interacting with members of the community, just as a way to immerse them in a faith,” Skowronski said. Wilson wanted more students to be given this chance so she contacted Skowronski about bringing speakers in as part of project based learning to teach kids about world religions. The six religions presented were Christianity, Islam, Judaism, Buddhism, Hinduism, and Sikhism, which were also taught in the students’ world history classes, Wilson said. “I think it’s important kids are exposed to different religions and have a better understanding of it so they can speak more intelligently about it,” she said. Seventh grader Abby Nellis said the focus of the journeys and presentations was to understand different religions and how they work. Student Faith Kroll said she learned all the religions believe in treating everyone equally and helping people. “It’s important because you need to learn how other people feel and how they see things, not just how you see it,” Kroll said. Skowronski thinks there’s a lot of misunderstandings among different faiths and allowing young students to experience members of other faiths helps break barriers and stereotypes. Emily Walters went on the religious diversity journeys and said the presentations helped clarify questions she had about the different religions. DEARBORN HEIGHTS, Mich. (AP) – When the Islamic Institute of America bought a Baptist church, the plan initially was to remove the pews – until the mosque’s leader objected, in part because he saw keeping the benches as a way of showing Islam’s compatibility with its sister faith. “We’re sending a message to non-Muslim visitors and friends – particularly our interfaith community and Christians,” Iman Hassan Qazwini, one of the top Shiite Muslim leaders in the U.S., said from what’s now the institute’s lecture hall. Qazwini said reaching out to Christians, Jews and others has never been more important, with a U.S. president who has said Islam hates the U.S. and polls finding most Americans holding negative views of the faith. He sees education and outreach as the primary missions of the Islamic Institute of America in the Detroit suburb of Dearborn Heights, which has one of the largest and oldest Arab-Muslim communities outside the Middle East. Qazwini, who comes from a family of prominent American Shiite scholars and is of Iraqi descent, said he hopes to quell fears and misunderstandings through regular interfaith gatherings and a media division that will produce short videos and other internet-based programming. Next year, the center plans to launch a seminary aimed at equipping a new generation of Muslim leaders who can help forge a better understanding of Islam in the West. He said the seminary would not only help produce well-rounded scholars who can engage with the wider world, but also better serve their U.S.-born congregants. “One of the issues we Muslims face in the country is … the huge gap that exists between leaders coming from the Middle East to lead our Islamic institutions and their congregations. For most of those leaders, including myself, it takes years to adapt with the environment, with the American psyche, mentality and even lifestyle,” he said. Qazwini’s new institute is just a few miles from the Islamic Center of America, one of North America’s largest mosques and where he served for 18 years before leaving in 2015. Takim said Qazwini is “a man of great vision,” and delivering on his plans for the institute will be “an exceptional feat and a great challenge,” given rising anti-Muslim sentiment. A Pew Research Center survey conducted in 2014 found Americans view Islam less favorably than other major religions and atheism. Another Pew survey found 38 percent of Americans think Islam is more likely than others to encourage violence among its followers, while 50 percent think it is not more likely. President Donald Trump’s campaign was marked by anti-Muslim rhetoric and, since being inaugurated, he’s sought to enact a travel ban from several Muslim-majority countries. Qazwini said perceptions of Islam are hurt by acts of violence or terror committed by people who call themselves Muslim. He criticizes the media for rushing to associate someone’s crime with his religion if that person is or appears to be Muslim. Just because somebody acts “in the name of religion,” it “doesn’t mean the religion is acting,” he said. Still, he can understand the fears. Qazwini said his institute seeks to educate Muslims and non-Muslims alike, and make them feel comfortable in each other’s company. “We’re not your enemy,” he said. When I reached my son’s school, I saw the principal and a teacher watching a YouTube video whilst trying to re-tie my son’s patka, which had come off. My heart melted to see so much love for the Sikh turban” – Amarpreet Singh, whose 5-year-old son studies at a Christian school in a Melbourne suburb. MELBOURNE (Australia): United Sikhs organization and the Sri Guru Singh Sabha Gurdwara Craigeburn honoured on Sunday the principal and a teacher from the Mother of God Christian school in the Ardeer suburb of Melbourne. They were honoured for showing their Christian spirit on March 24 when they re-tied five-year-old Mansage Singh’s patka, a head wear worn by Sikh children. This was in sharp contrast to the experience of another five-year-old Sikh student, Sidhak Singh, who was refused admission last year by the Melton Christian College of Melbourne, because he wore a patka. Sidhak Singh’s father, Sagardeep Singh, has filed a complaint, with the Human Rights Division of the Victoria Civil and Administrative Tribunal (VCAT), which is listed for a three-day hearing from July 24. United Sikhs has arranged for legal representation for Sagardeep Singh through the prestigious international law firm of Herbert Smith Freehills LLP. You may read about the patka ban faced by Sidhak Singh here. “Hello Amar, I am sorry that your son’s turban came off this morning. I did my best re-tying it back by watching many YouTube videos but am missing on the finishing touch. I am just wondering if you can come and tie his turban accordingly. We are really sorry. The boy who took his turban off is autistic. We explained to him why he must not touch the turban again, but he did it by accident,” the principal of the Mother of God School said in a telephone call to Mansage Singh’s father, Amapreet Singh. The school principal, Gerard Broadfoot, and teacher, Michelle Buckley, received a siropa, a cloth of honour, from the gurdwara in a ceremony on Sunday. They also received a ‘Defender of the Sikh Dastaar’ award from United Sikhs. Mansage Singh was also honoured by United Sikhs and the gurdwara for helping his principal and teacher to re-tie his patka. “What we did at school with Mansage was to look after him and make him feel safe. We look after each other. We are very honoured to be given this award today,” said Broadfoot. “I feel very humbled to be here in front of so many people for doing such a small thing. It is something we would do every day with all the children to provide them with respect and care because we are a Catholic school for all people,” said Buckley. “Sikhs are often in the news for turban removal or discrimination but this school principal and teacher has set an example and showed that humanity is alive, when they re-tied a Sikh student’s patka. The Australian Sikh community is very honoured by their action,” said Gurdeep Singh, President of the Craigeburn Gurdwara, one of the largest gurdwaras in Melbourne. “The Mother of God School has set the standard for all schools to follow and shown that a child’s education at a school should not be at the expense of a right to practice his or her faith,” said Gurvinder Singh, United Sikhs Director, Melbourne. “We are very humbled and very proud to know that our son is being educated in a school that respects the beliefs of every culture and religion and it takes care to protect the belief of all students,” said Amarpreet Singh. “All the school kids have to wear sun hats when they go outside to play but since my son ties a patka he was given an option to not wear the hat. The principal asked our permission for the school logo to be printed on Mansage’s patka,” he added. How did Reform Jewish clergy talk about Jesus in their interfaith dialogues with Christians? The subject became a flashpoint, when on December 20, 1925, Rabbi Stephen S. Wise (no relation to Isaac Mayer Wise), preached a sermon in Carnegie Hall on the book, Jesus of Nazareth: His Life, Times, and Teaching, by Joseph Klausner of the Hebrew University. Jesus was a man, not divine or a myth. Jesus was born, lived and died as a Jew. He was not a Christian. Jews have not repudiated Jesus the Jew, nor many of his teachings. Christians have, for the most part, not fully adopted or followed the teachings of Jesus, and have, in Jesus’ name, often mistreated and persecuted the Jewish people. Many Orthodox rabbis publicly attacked Wise, but he retained the public support of most Reform rabbis. Needless to say, Jews never can and never will accept Jesus as the Messiah or as the Son of God, but, despite this constant reality, there is room for improved understanding and openness to change in interpreting Jesus as a positive and prophetic spirit in the stream of the Jewish tradition…. Do you recall any significant rifts separating Jewish and Christian clergy? One in particular comes to mind. In 1945, Rabbi Roland Gittelsohn, a U.S. Navy chaplain who served with the Marines during the battle of Iwo Jima, was asked to deliver the main memorial address at an interreligious dedication of the military cemetery on the island. Several Christian chaplains objected to a Jew delivering a eulogy over Christian graves, though at least 150 Jewish soldiers died in battle. Whosoever of us lifts his hand in hate against a brother, or who thinks himself superior to those who happen to be in the minority, makes of this ceremony and the bloody sacrifice it commemorates, an empty, hollow mockery…. How has interreligious relations changed in recent decades? Once limited to Christians and Jews, it now includes Muslims, Hindus, Buddhists, and members of other faith communities. What has remained constant is the Reform Movement’s commitment to positive engagement across religious lines. When it comes to relationships, Janice Boboltz and Leslie Kirchoff would far prefer to see bridges built between people instead of letting differences divide. Troubled by today’s super-charged negative political climate, the two decided to do something positive for the community – hold a modern-day peace event. With help from a sizable core group, they put together an event called Who Is My Neighbor? It was Saturday, from 11 a.m. to 4 p.m. at the Fletcher Street Depot, and promoted peace, tolerance and community primarily through the arts. Initially, the organizers were concerned about finding enough activities to engage people for the six-hour time frame of the event. Their worry, however, proved unfounded. It’s a good problem to have since so many have expressed a willingness to participate. There was everything from crafts for children, yoga for adults, entertainment by local musicians and dancers from the 4-D 2nd Street Dance Company to informational booths, food truck refreshments and even a chance to purchase peace-themed t-shirts. Thunder Bay Theatre Artistic Director Jeffrey Mindock served as master of ceremonies for the day. Art in the Loft Gallery Coordinator Justin Christensen-Cooper provided a peace mural that visitors can add their own special touch to with paint and a brush. A visual representation of peace, tolerance and community came through the photographs by Bev Suszek. In planning Who Is My Neighbor?, Boboltz and Kirchoff took their cue from previous events held in Alpena and sponsored by Building Bridges, a local group that focuses on bringing programs to Northeast Michigan to educate and inform others about diversity. One such program held in September 2016 revolved around the Interfaith Amigos, who include a Christian pastor, a Jewish rabbi and an iman from the Islamic faith tradition. As a result of getting to know the Interfaith Amigos and connecting with an interfaith group in Detroit, Boboltz and Kirchoff learned about a new event there called Flip the Script. It’s purpose, they said, also was to focus on love rather than hate. After kicking around the concept, the two women along with the rest of their committee, decided to hold an event in Alpena. There is a Jewish Deli in Brooklyn that closes for Ramadan. The reason is simple, if somewhat surprising: The owner of David’s Brisket House and Deli on Nostrand Avenue in Bedford-Stuyvesant is Riyadh Gazali, a Muslim of Yemini descent. The Muslim-Jewish Deli Dinner Party will raise money for the HIASorganization, which was founded in 1881 to assist Jews emigrating from Russia and Eastern Europe, and which helped resettle over 150,000 Jewish refugees after World War II. HIAS now helps place Muslim refugees. David’s Brisket House, which serves classic (though not kosher) Jewish fare, was opened in the 1930s and sold in 1970s to two Yemini men who owned a bagel shop across the street. One of them was Jewish; the other Muslim. Eventually, the Jewish owner left the picture and the other, Gazali’s uncle, became the sole proprietor. He didn’t change the menu, which consists of classics such as Reubens and pastrami sandwiches. For the fundraising dinner, a set menu costs $45 per person and consists of pickles, half a pastrami on rye (with mustard on the side); half a brisket on rye (with gravy on the side); half an order of fries; half an order of potato salad; a soda and a slice of cake. Meanwhile, on June 15, The NYC Muslim-Jewish Solidarity Committee is holding its 3rd-annual Iftar-in-a-Synagogue celebration to break the Ramadan fast, at Temple Emanu-El in Manhattan. There will be food and live music. Tickets cost $20 and proceeds will be used to help fight hunger in New York City. Ramadan runs from May 26-June 24. Reaching out to people of other religions can be both challenging and enriching for individuals and is the only hope for true peace in the world, said a variety of religious leaders, including Pope Francis. The pope and his friend Rabbi Abraham Skorka appear in a video montage and together in their own video as part of the “Make Friends” initiative coordinated by the Elijah Interfaith Institute, which has offices in Israel and in Dallas. The video series, posted on YouTube June 14, also includes Orthodox, Anglican and Lutheran leaders, Jewish rabbis, Sunni and Shiite Muslim clerics, Buddhist monks and nuns, and Hindu and Sikh leaders. In their video, Francis and Skorka talk about how their own religious convictions led them into conversations with each other, and how those conversations not only increased their understanding of God and formed the basis of a television series and book, but also led to true friendship. Rabbi Alon Goshen-Gottstein is the founder and director of the institute. 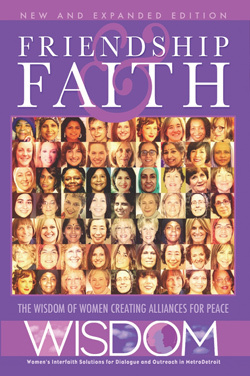 To learn more about the Elijah Interfaith Institute and the “Make Friends” initiative, visit http://elijah-interfaith.org/. When most people think of Omaha, they imagine sizzling steaks, billionaire Warren Buffet or even former NFL quarterback Peyton Manning calling out before the snap. (Remember “Omaha-Omaha”?). But if a group of clergymen have their way, Nebraska’s largest city will soon also be known as the home of interfaith dialogue and peacebuilding. A rabbi, a reverend and an imam (no, it’s not a setup joke) are partners in a decade long quest to bring together the three Abrahamic faiths — Judaism, Christianity and Islam — to share and worship on the same property. It’s called Tri-Faith Initiative. The three clergymen leading congregations participating in the Tri-Faith Initiative are (L-R) Temple Israel Rabbi Emeritus Aryeh Azriel, Countryside Community Church Senior Minister Eric Elnes, and American Muslim Institute Imam Mohamad Jamal Daoudi. “We didn’t create this (project) to tolerate each other. We didn’t create this just to have a dialogue,” explained Rabbi Aryeh Azriel, the former senior rabbi at Omaha’s Temple Israel, whose vision helped drive the project. “We have done all this stuff already. It’s about what are we going to do together. What are we going to do for the betterment of humanity?” The location chosen for the sacred endeavor is the old golf course of Highland Country Club, a “Jewish Club” developed in the 1920s when Jews were excluded from other clubs in the city and around the country. Today, a new synagogue and mosque stand tall on the abandoned greens and fairways, and construction crews are readying to build a new church. Further plans include a Tri-Faith Center, which will be completed in 2019 and serve as a shared community space for interfaith classes and activities. The developers say they’re excited for what the future holds. They’re also proud that a land once formed out of division, has now become a symbol of religious tolerance. Temple Israel’s new synagogue opened in 2013 and cost more than $21 million to complete. The first of the Tri-Faith project, it’s a modern, 58,000-square foot building that features hand-cut stone imported from Jerusalem, a symbol of the Reform congregation’s connection to the Holy Land. “If you can’t create peace in the Middle East — what about Omaha?” quipped Rabbi Azriel, 67, a polio survivor from Israel. He likes to share a story from one of his congregants who was initially apprehensive about sharing land with Muslims. The man, who would later become a donor, privately expressed fears about Islamic extremists attacking the synagogue. “What if there’s a live hand grenade rolled in the middle of the aisle during the high holidays,” the man asked. The rabbi answered there were two options. “One is to run away. But as a polio survivor, I can’t run far away,” he said with a mix of sarcasm. “The other one is for me to fall on it.” The answer, Azriel said, brought tears to the man’s eyes. Azriel believes that fear isn’t a strong enough reason to cease the project. In fact, he said the idea was born out of the tragedies of 9/11, when fear was at its highest level and he and some congregants went to defend a local mosque from vandalism. The gesture, he said, led to new friendships and a dialogue between members of the two faith communities. Years later, when Temple Israel began making plans to relocate its aging synagogue, the rabbi and a handful of others formed Tri-Faith Initiative, and articulated their vision to have three faiths occupy the same 35-acre space. “It will be a little taste of paradise,” said Azriel. The American Muslim Institute is a stunning $7 million mosque that opened in June, just in time for Ramadan, Islam’s holiest month. The 15,000-square foot building has all the comforts of a modern-day mosque, including state-of-the-art feet washing stations, classrooms and recreation areas, counting a basketball court. The centerpiece is the cavernous prayer room, where about 50 people attended on a recent evening. The tranquil sounds of the Imam’s chants echoed throughout the room, which has separate spaces for men and women. Yearning for a new opportunity, Imam Mohamad Jamal Daoudi agreed to lead the congregation after a stint with another mosque in Augusta, Georgia. “Refreshment for my soul. I was very enthusiastic to join the group,” said Daoudi, 52. Imam Mohamad Jamal Daoudi peers out the window of Temple Israel and sees his new mosque. A Syrian native, Daoudi has been in the United States for 22 years and says it’s the first time he’s seen such an ambitious idea materialize. The conflict between Jews and Muslims in the Mideast should not be an impediment in making peace in the Midwest, he said. There are “so many good things as human beings to enjoy and embrace, rather than just focusing on one issue,” Daoudi said. Countryside Community Church, part of the United Church of Christ, has a perfectly fine building less than 15 minutes away from the Tri-Faith site. It has served the congregation well for 60 years and could easily have remained for another several decades. “Almost no congregation in America moves without some outside pressure, like the roof caving in,” said Rev. Eric Elnes, the head pastor. “We are moving simply because we fell in love with the vision of Tri-Faith.” Elnes, 53, said the vast majority of his congregation voted for the move, despite the inherent challenges in raising the $26 million required to fund the construction of a new church. Children playfully shovel the dirt after a groundbreaking ceremony for the new Countryside Community Church earlier this month. The church is designed to provide congregants with a view of the synagogue and mosque. Measuring 65,000 square feet, it will include a traditional narthex, courtyard and numerous shared spaces intended to maximize interaction. “Tri-Faith would have made sense throughout any of our religious histories, but in this time, it makes more sense than ever,” Elnes said, alluding to recent terrorist attacks in London and elsewhere. The hiring of an executive director will help turn the interfaith vision into practice, the clergymen say. Omaha, while not as conservative as the rest of deep-red Nebraska, has not been historically progressive or taken bold steps to promote inclusiveness. But the state’s monikers — originally “Nebraska Nice,” but recently changed to “Nebraska. Good Life. Great Opportunity” — capture the state and broader Midwest’s easygoing nature. That doesn’t mean Tri-Faith Initiative has eluded controversy. Locally, the most outspoken opponent has been Dr. Mark Christian, executive director of Global Faith Institute. Christian, who converted from Islam to Christianity, believes that the Quran forbids Muslims from becoming friends with Christians and Jews. It’s a controversial and widely admonished assertion that’s commonly propagated by Islamophobes. Christian has also raised alarm by proclaiming that the Tri-Faith partners could become targets of violence. “I can see it trigger those militant Muslims,” he told CNN. The fearful rhetoric recently spilled over into a city councilman’s election race. Candidate Paul Anderson criticized the mosque’s construction. The Omaha World Herald reported that his website said there should be no mosques in the city. Anderson exited the race in April after being widely rebuked. Mostly, though, the feedback has been positive, say the clergymen. They’re also hopeful that the initiative will influence other communities to launch similar projects across the United States and beyond. It’s a sentiment that the Rev. John Dorhauer, general minister and president of the United Church of Christ, shared during this month’s ceremonial ground breaking for the new church. Dan Simon attended Temple Israel as a child while growing up in Omaha, Nebraska.